My pal Bill rang yesterday to see if I fancied a short evening's fishing. To be honest the conditions had been fairly grim with south-southwest gales and a string of heavy showers. However, it was the first decent tide of the series and under normal conditions would give a fair chance of a mullet/bass bonanza if there were maggoty weed middens about. Anyway, I said "Yes!" Bill picked me up just in time for us to get half-an-hour of fishing before high tide and off we went. 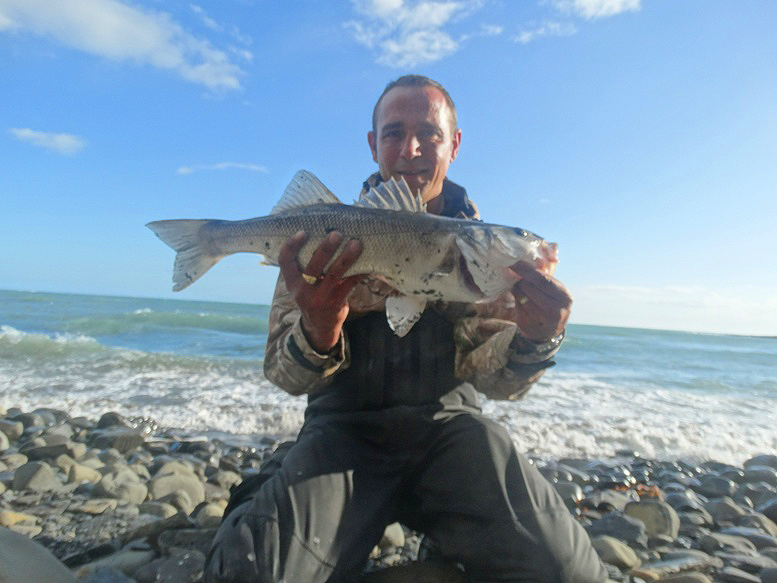 We were so sure that all the maggots were washed away by the recent storms (we were wrong but the mullet didn't turn up) that we only took spinning rods. Bill's gear was armed with a SlugGill and a 10g cone weight on its snout while mine was an unweighted Slandra. The place we'd hoped to go to was more or less inaccessible with big waves crashing up to the base of the cliff so we had a quick discussion, nipped back to the car and drove to a slighly more sheltered shoreline. As we trudged along the beach the sea was not too rough, despite the stiff wind. After we'd gone a few hundred metres we came across a lot of fresh kelp in the water, often a good bass indicator, so Bill decided to give it a go. I plodded on to our intended mark which was further along but still within view of Bill's spot. 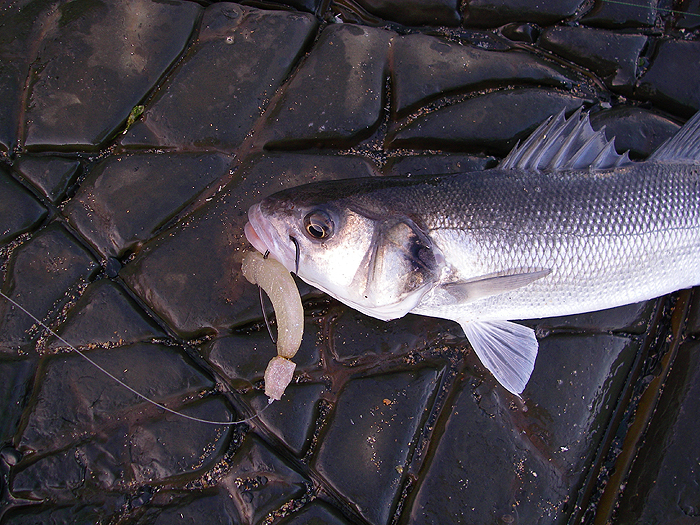 I began to fish, casting the lightweight lure into the breaking waves and ever so slowly retrieving. For about twenty minutes there was nothing doing. I glanced back to my pal's stance to see him scurrying about the beach. 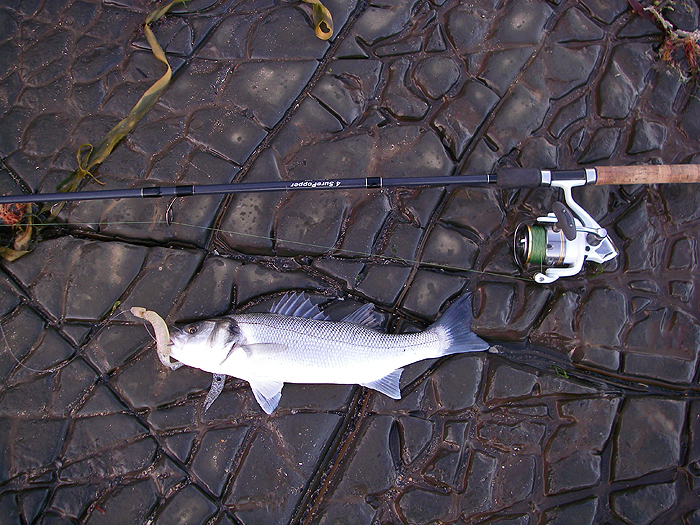 A silver flash showed that he had a fish and he was clearly preparing to take its picture. I steeled myself against returning to see what he had caught and continued fishing. It was probably another twenty minutes before I had a sort of bite. I say "sort of" because I wasn't sure at first that it was a fish. I continued winding and knock-knock, there it was again. Now, I'd already had dozens of casts into the same area without touching a rock or any sort of snag so this time I was quite sure that it was a fish. For a third time I felt it knock knocking and by now I'd decided that it must be a wrasse plucking at the tail of the lure. Then, WALLOP! The rod bent and the clutch zuzzed. The zuzzing was brief because it clearly wasn't a very big fish but it was a bass. I took its picture and put it back thinking that there must have been a shoal of them in the gully to give me several tentative bites on the same cast. I fished on with renewed enthusiasm but that as they say was that. I walked back to where Bill was fishing and it turned out that he'd had no more bites after the fish I'd seen him catch. It had been three times the size of mine so he was chuffed but he also had a tale to tell. Apparently he'd hooked the fish and played it to the breaking waves at the edge. He was about to nip down and pick it up when suddenly his line went slack and he lost contact with it. Panic set in and he frantically wound the reel and tried to see what had gone wrong. 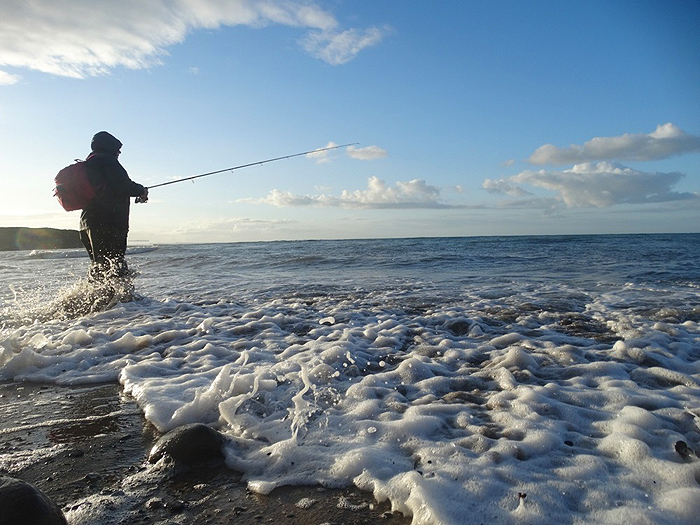 By the time he realised that the bale arm had been opened by the pressure of the line and that the fish was still on it had swum sixty metres out to sea and he had to play it all the way back in. Altogether it was a good hour-and-a-half's fishing and we returned to the car well pleased and with stories to relate. That's fishing!